Dion Phaneuf was introduced as the new captain of the Toronto Maple Leafs at the Real Sports Bar & Grill at Maple Leaf Square on Monday. He becomes the 18th captain of the Maple Leafs and the 22nd in the long history of the Toronto franchise dating back to the roots of the Toronto Arenas and Toronto St. Patricks. On hand to assist with the special announcement were former team captains George Armstrong, Wendel Clark and Darryl Sittler. 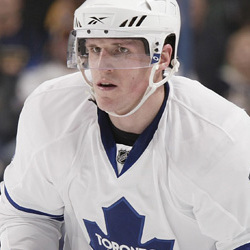 Phaneuf, 25, was obtained by the Maple Leafs in a multi-player trade with the Calgary Flames on January 31, 2010. He played in 26 games after his arrival and recorded two goals and eight assists while picking up 34 minutes in penalties. He averaged 26:21 in ice-time with the Maple Leafs. Overall in 2009-10, he collected 32 points (12g, 20a) in 81 contests. The native of Edmonton, Alberta leads all NHL defencemen in goals (77), powerplay goals (48), game-winning goals (22) and shots (1237) since entering the league in 2005-06. He has played in at least 79 games in all of his five NHL seasons since entering the league in 2005-06. He was runner-up for the James Norris Trophy as the NHL’s most outstanding all-around defenceman in 2007-08 and was a nominee for the Calder Trophy as the league’s top rookie in 2005-06.